A complete listing of all of the many patterns cut by T. G. Hawkes & Company has yet to be compiled. The following list is preliminary and includes only “geometric”, and not “realistic”, patterns. Selected patterns are illustrated. This check list is based on one provided by Bettye Waher in her privately printed book THE HAWKES HUNTER. However, many additions — not known to Mrs. Waher at the time her book was written — have been made to her list. 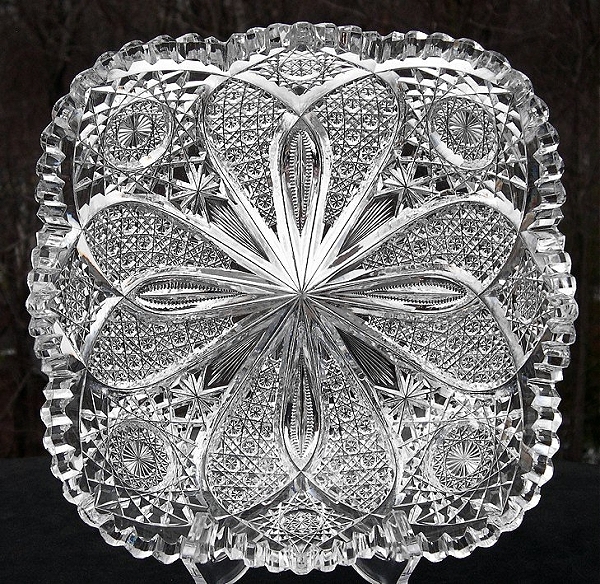 Because the present list is only concerned with geometric patterns, all engraved patterns, including those in the rock crystal, Gravic, and satin-engraved styles, have been excluded. 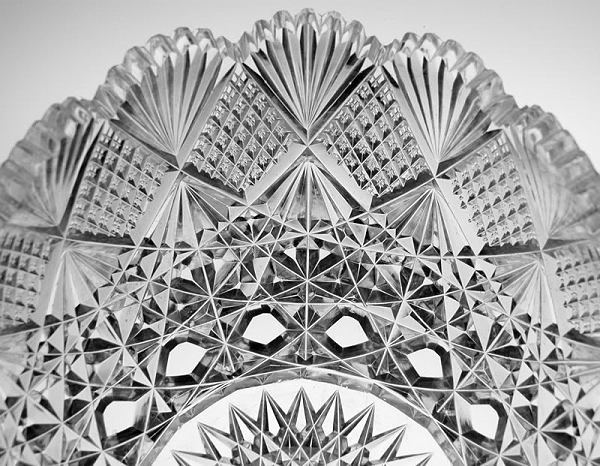 Also excluded is the series of “Waterford” patterns used by Hawkes primarily for stemware. These categories were of special interest to Mrs. Waher, however, and her original list includes many of them, illustrated. Items from the Signet Glass Comapany, “a cheaper Hawkes line” (Spillman 1996, p. 214), also are not included. All patterns that have assigned, or “coined”, names have been excluded, even when a pattern is known to have been patented by Hawkes. 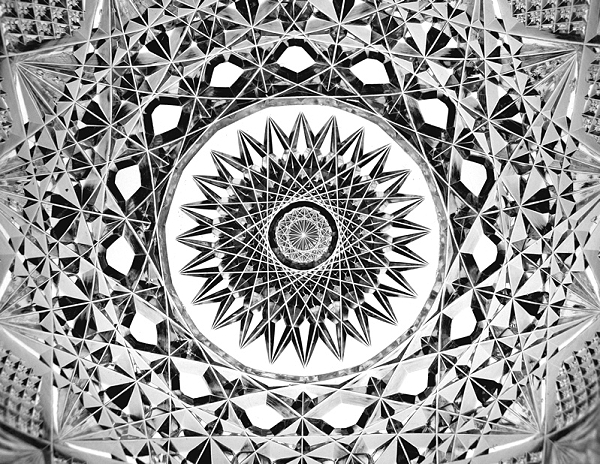 Unfortunately, we do not as yet know the official, catalog names for two of these patented geometric patterns; they are given at the end of the present list. 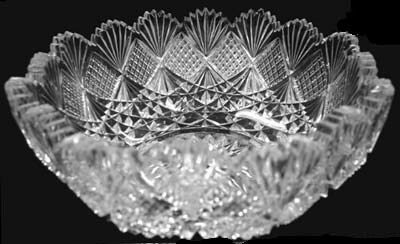 The additions referred to above were obtained mainly from the Spillman (1996) and the Sinclaire and Spillman (1997) books, together with a Hawkes cut glass catalog published by the American Cut Glass Association. A few microfiche compilations were also examined. The writer hopes that readers can submit pattern names that can be added to this list. Please note that each submission should include “authentication”, that is, it should include a citation to a catalog, a photographic inventory, or an advertisement. He would also appreciate hearing of any pattern listed that is categorically primarily engraved. This sometimes requires a subjective judgment: some of the patterns listed here are half cut and half engraved. Finally, the reader should be aware that some patterns were neither named nor numbered by T. G. Hawkes & Company. And a few names were used repeatedly, for more than one pattern. When this is the case there is a number in parentheses following the pattern name indicating the number of times that particular name was used. The Brunswick pattern was introduced by Hawkes about the year 1900 and was available for several years thereafter. The pattern is found both unsigned and signed, but usually it is found signed, as in this example. 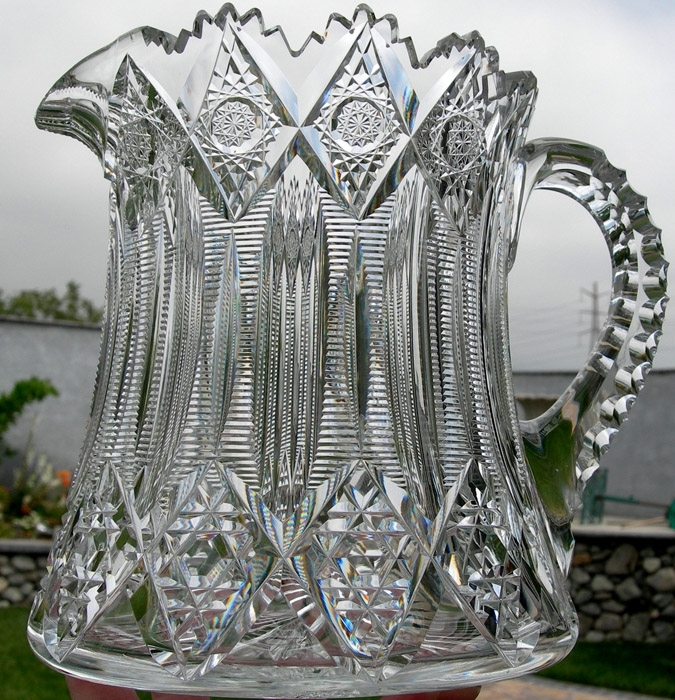 Additionally, the chain of elaborated 6-pt hobstars, with clear centers, around the base of the pitcher, such as shown here, may or may not be present, depending upon the type of blank used and its size. 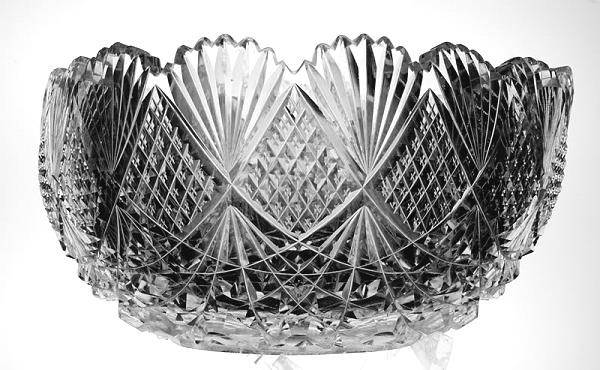 This image was chosen because it illustrates the realism that is often attained when cut-glass items are photographed in the “open air”. In 1978 Pearson rated the Brunswick pattern 5 – 4 (rare and high priced), a somewhat midling rating. The 2005 ACGA popularity poll indicated that the pattern was 66% as popular as the poll’s “winner”, Meriden’s Alhambra pattern. Although the Pearson rating and the 2005 popularity poll are not directly comparable, they suggest that the popularity of the Brunswick pattern has remained more or less unchanged during the past 30 Years. Pitcher cut in the Brunswick pattern, signed Hawkes. Triple-notched handle, 32-pt single star on base. H = 6.25″ (15.9 cm), base D = 6″ (15.2 cm). Offered for sale on an eBay auction in 2008 where the pitcher failed to sell (The maximum price offered, $535, was below the seller’s “reserve”.) (Image: Internet). D(along side) = 8.75″ (22.2 cm), H = 2.75″ (7.0 cm). Sold for $483 at an eBay auction in 2010 (Image: Internet). The Cobweb pattern was probably introduced by Hawkes about 1887 and was included with those patterns sent to the Paris exposition in 1889. Contrary to Spillman 1996, p. 92, it was never patented. 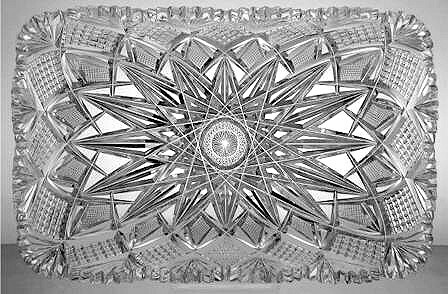 This pattern also appears in a c1888 C. Dorflinger & Sons catalog where it is given the pattern number 643. At this time the Dorflinger catalog (reprinted by the ACGA) lists several Hawkes patterns that were sold by Dorflinger on consignment. While the cutters at C. Dorflinger & Sons could have replicated the Hawkes patterns, it is more likely that they were cut in Corning and shipped to White Mills, PA and Murray St., NYC “on consignment” for sale by Dorflinger. Whether such items were actually sold as “Dorflinger glass” or “Hawkes glass” is an open question, although the former seems more likely, especially if Dorflinger’s trademark paper label were attached. A bit of harmless deception, perhaps? First Bowl: In any case Dorflinger provided the blank: no. 250 in its catalog, or no. 709 in the Hawkes “Number Book” of blanks (Spillman 1996, pp. 91-93, 108). Concerning Hawkes patterns that are also found in Dorflinger catalogs: most collectors check the item’s rim and if U-notches are present (as in both of these examples), Hawkes is assumed to be the manufacturer. D = 9″ (22.9 cm), H = 4″ (10.2 cm), wt = 5 lb (2.3 kg). Damage: “This bowl has two missing teeth and a few fleabite nicks along the teeth.” Sold for $300 at an eBay auction in 2003 (Images: Internet). Second Bowl: Cobweb by Hawkes (or No. 643 by Dorflinger). This example is shown as blank no. 360 in the Dorflinger catalog. D = 10″ (25.4 cm), H = 4.75″ (12.1 cm), wt = 6 lbs (2.7 kg). Offered at an eBay auction in 2010; bid price of $410.35 failed to reach the seller’s reserve (Images: Internet). Note that the Cobweb pattern is an example of a flashed hobstar of x-number of points. In both of these examples the number of points is 15 and they are flashed with 7-ribbed fans. Because the hobstar was a widely used device at this time T. G. Hawkes might have felt that the Cobweb pattern was not sufficiently “unique” to qualify for a U. S. Patent. This would explain why there is no record of his having applied for such a patent. In some respects the Devonshire pattern can be thought of as a simplification of the Cobweb pattern (illustrated above). It was introduced by 1900 and is a “border” design, where the border is independent of the pattern’s basal hobstar, a Hawkes characteristic that can be traced back to at least the company’s Brazilian pattern of 1889. From 1950 to 1994 the Devonshire name was erroneously applied to the patented pattern now recognized as Princess (I) (pat. no. 18,301). A further confusion occurred when Pearson (1965,p. 48) illustrated two patterns as “Devonshire” by Hawkes, mistakenly believing them to be variations of pat. no. 18,301, which they are not. 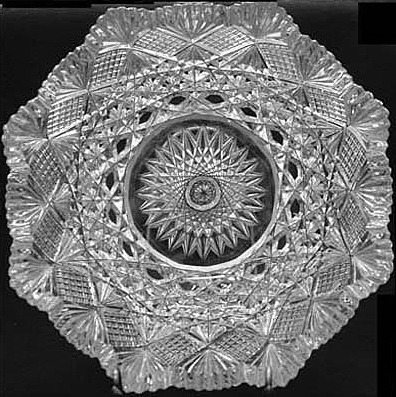 On the tray illustrated here note the finely cut, multi-pointed Brunswick star on the hobstar’s hobnail, another Hawkes characteristic of this period. 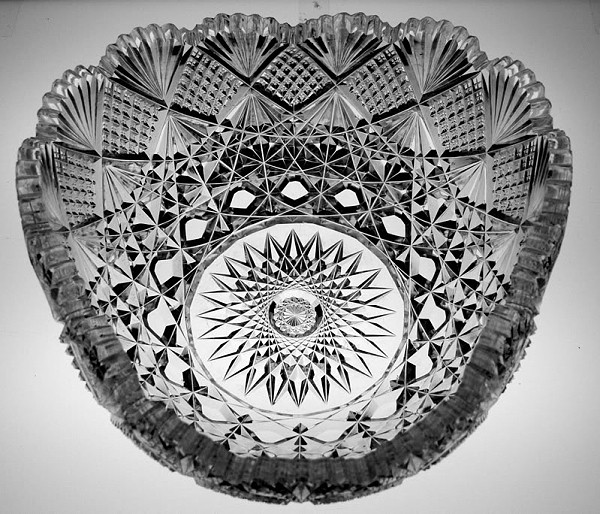 In common with many examples of the Devonshire pattern, the tray is not signed; only those examples that were produced after c1902 are found with the acid-etched Hawkes trademark. L = 11.5″ (29.2 cm), W = 7.5″ (19.0 cm), H = 2″ (5.1 cm), wt = 4.25 lb (1.9 kg). Failed to sell at an eBay auction in 2001 where the seller’s reserve was greater than $177.50 (Image: Internet).